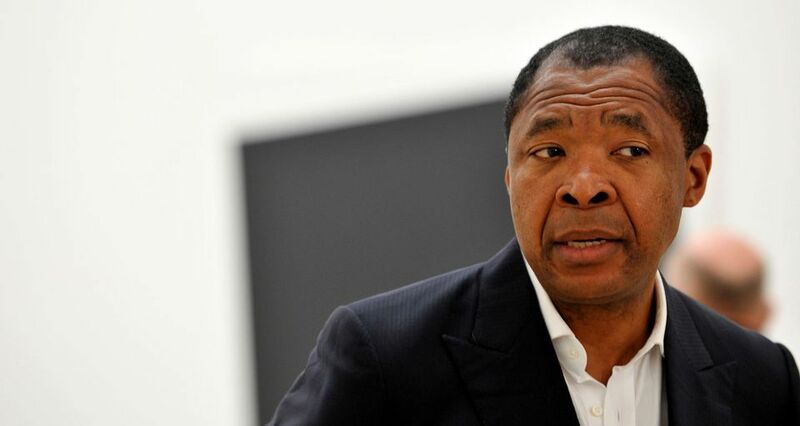 Okwui Enwezor, the curator of Documenta, the Venice Biennale and the former director of Munich's Haus der Kunst, died today aged 55. We delved into our archive and dug out this interview, which we published shortly before the unveiling of his main exhibition at the 56th Venice Biennale. When Okwui Enwezor introduced the plans for his international exhibition for the 56th Venice Biennale, he began by quoting the philosopher and critic Walter Benjamin’s interpretation of Paul Klee’s print Angelus Novus, 1920. Benjamin, writing in 1940 as he attempted to escape the Gestapo, read Klee’s image as an angel of history, contemplating the past as “one single catastrophe that keeps piling wreckage upon wreckage and hurls it in front of his feet”, yet propelled by the “storm we call progress” into the future. Today, Enwezor writes that he sees “a global landscape that again lies shattered and in disarray”, and as a result, his exhibition in the Giardini and the Arsenale, entitled “All the World’s Futures”, will be the most politically minded Venice Biennale for some years. At its core is the Arena, an auditorium designed by the architect David Adjaye in the central Giardini pavilion, where all four volumes of Karl Marx’s Das Kapital will be read aloud by participants directed by the British film-maker Isaac Julien. This is just one of three “filters” within the main concept; the others are “Liveness: on Epic Duration”, which emphasises performance, film, song and discussion, so that the exhibition is a “continuous, unfolding and unceasing live event”, Enwezor says, and “Garden of Disorder”, which takes the theme of the garden generally and the Giardini, with its national pavilions, specifically, as a metaphor to explore “the state of things”. The Art Newspaper: Your introductory text to the Biennale begins with a quotation by Walter Benjamin that directly links visual art to world events. You have described it as a “touchstone” for the show. Okwui Enwezor: Yes, because Benjamin always thought visually and was very perceptive in his reading of the relationship between the image and the historical and, of course, the political. That reflection in the midst of a comparable moment of precarity, fragility, incompleteness—while not necessarily exactly the same as this moment—is a reminder of this idea of permanent transition; that it’s almost as if we are condemned to a series of incompletions and that is how newness comes in the world, through incompletion. You’ve used the term “parliament of forms” to describe the show. What do you mean by that? For me, it’s a question of gathering, a coming-together to think about our common work; art here is not something that’s rarefied and separate from this set of relationships. So this parliament of forms is a way to rediscuss the vitality, the necessity, the importance and the essentialness of art in our lives, in our common culture, at a time when historical and artistic objects have been destroyed. And [it is also a way] to call attention to another thing Benjamin said: that there is not a single image of civilisation that is not itself an image of barbarism [Benjamin uses the term “document” rather than “image”]. Everybody’s looking at what is going on in Iraq or the blowing-up of the Bamiyan Buddhas and, as disturbing as those things are, I think, the battle between Greece and the British Museum for the Elgin Marbles… yes, one is preserved, but it’s pried loose from its context; it is a form of destruction. I don’t want to get into the politics of that, but I think you get the point. So the “parliament of forms” is this conversation between forms and between practices. One thing that is a recurring leitmotif in the exhibition is the recurrence of words, whether spoken, read, recited, sung, painted or drawn. The show will include readings of Das Kapital in its entirety—why is that such an important gesture? It might well be a disaster, I don’t know. It’s one thing to propose it as a gesture; it’s another thing to realise it in an impeccable manner. But that’s not the point. The point is not necessarily to succeed—the point is to suggest one way that one can think about the exhibition frame. I don’t have a theme, but I have a statement of intent through the title. And through that statement of intent, one creates a frame, and those frames are a series of filters that one can use to perceive—to scan, if you will—the body of the exhibition. The reason why Das Kapital resonates so deeply is because our contemporary drama is taken up by all these questions. I wanted an object that will create a strong drama inside the exhibition, because of its difficulty, because of its controversial nature, because of the way in which the book itself and the work of the author have been employed through different ideological structures. If you go to the end of my text, I end with a quote from Louis Althusser, which [discusses reading] Das Kapital as if we have encountered it for the first time. In the Arena, it will be the first time for many people; many people have not read it. I am not trying to claim that I am an expert in this, but the Arena is a strong gesture. It’s locational; it’s a way to provide a GPS for the operation of the show itself. The anachronism of the pavilions seems to have been an obstacle to curators in the past, but you have really embraced it. Why? There are very obvious reasons why curators in the past have been ambivalent about the national pavilions. I don’t mind the dissolution of national pavilions in other biennales, but it makes no sense in Venice, simply because it was built as such, whereas the other biennales were in the business of emulating Venice, so they really are not bringing anything original to the table. So if national pavilions disappear from them, those biennales can continue, but Venice is a completely different kind of experience. That’s why it’s been very attractive to many countries, because it speaks to the fantasies and the desires that many of us carry about our place in the world. So I embrace this because it has an incredibly rich intellectual and historical use-value. And that’s why I was enthusiastic about it—it’s not an obstacle at all. What do you hope for or expect from a visitor to this year’s Biennale? The intention is one of incompleteness, that it’s not a package that’s doled out in exactly the same way to everybody. It’s to resist homogenisation, to resist the monotony of the same. And people’s looking habits, in any case, are very different. There are people who will spend a day, there will be people who spend three days, there are people who will come for a few hours. Different visitors are going to get different things out of it; different demographics are going to see it differently. I’ve often said that one doesn’t see the Venice Biennale, one scans the Venice Biennale; because there’s so much, you scan it. It seems increasingly that the Biennale is a field for the arts in general, not purely the visual arts. The ancient arts were about the gesamtkunstwerk; the autonomous art form or medium is a recent invention. So now with performance, with the idea of duration and time and all of that in exhibitions, and choreography, we are coming full circle and re-entering this space. This parliament of forms can have some meaning and I think contemporary audiences are incredibly receptive to that. That’s why we’re increasingly seeing this confluence of practices coming together and living together. You were the artistic director of Documenta 11 in 2002. How does Venice compare? Documenta is much more ruminative. You’re invited, you have four years, you have an incredible opportunity for nuance. But with Venice, you have to hit the ground running. The other difference is the difference between Venice and Kassel. In Venice, you have such a density of art, so you are really already working within tradition; it’s not a tabula rasa. I’m not trying to say that Kassel is a tabula rasa, but it appears like that. You’re working with a sudden awareness of visual power and intensity, so you’re really not [going there] to teach people anything about the radicality of art; that radicality is part of it. So you have to take all of that in and put it on the side and say ‘I’m going to make my own exhibition’. But Venice is also slightly different simply because of the timeframe in which it is made. One can be much more reactive, [whereas] with Documenta you can be much more diagnostic, because it takes a bit more time. You previously suggested that you wouldn’t do another biennial after Venice. Do you still feel that way? Well, never say never. But it’s always good to go out on a high note. You can’t do the Venice Biennale and then go and do… I don’t know… [laughing, he declines to name another biennial]. So I will stick to that promise; this is it.